Amma was my external energy constantly motivating me. Considering this is my second time doing the Dhasa-sil, I wasn’t quite sure what to expect. There were flaws from my last Dhasa-sil, I now had a chance to fix. I was especially looking forward to this. I was looking forward to a stronger discipline of myself. To be honest, I was hoping to become more mindful and sustain mindfulness throughout this spiritual experience. Nothing out of the ordinary occurred during the beginning of the day, until Vipassana meditation. Bhante advised I try using three pillows, while I meditate. This unbelievably took out the stress from my joints, and I was able to maintain the posture for a while. I’m not sure if this was a placebo effect or the pillows did actually help me. Meditation is quite remarkable indeed. To truly meditate is an extremely difficult task in my opinion. It helped me raise my awareness of simply how unmindful I was. I struggled to concentrate on breathing for even a minute. Different thoughts constantly barraged me. This showed me how thoughts were not mine. Nonetheless, this was a step forward in the right direction. During Sutta discussion today we learned about the powers, “The five powers of one in higher training” as quoted by the Buddha. These powers are faith, shame, energy, wisdom, and moral dread. While I was unaware if I lacked the others, I knew I lacked energy. I have faith in Buddhism, but I don’t think I would being doing this retreat if my mom didn’t push me to overcome my torpor. In a way, Amma was my external energy constantly motivating me. We visited the Vietnamese temple today. What a unique experience it was. I already visited it once, but today I got the chance to see a charity in honor of Dr. Ambedkar. He was an Indian spiritual leader who helped many Indians in the lower caste. Overcoming numerous social and financial obstacles, Ambedkar became one of the first outcastes to obtain a college education inIndia. He helped over throw the caste system by telling many outcaste “untouchables” they aren’t judged by their heredity and skin color but through their actions. This was a revolution for many and I can quite understand why they looked up to him. It was honestly a different experience. The afternoon puja went on smoothly, but honestly I missed the days we used to do puja in the downstairs, it brought back old memories of times I did Katina puja with my family. I do realize the fact that I won’t achieve any sleep tonight, but regardless I am certainly going to make an effort. Good night. I woke up at around 4… I tried to fall asleep but my mind simply refused to comply. Morning meditation. Bhante was right; the mind is simply serene in the morning. I can’t explain the sense of calmness in the shrine room, while we meditated. Words couldn’t describe it. Don’t get me wrong, this is not sleepiness. I was fully awake the whole time. During the morning it was just easier to meditate since my body was fully refreshed. It was even easier to concentrate on Vipassana meditation during this period, since the mind was I guess you could say “clean”, since it was the morning. Regardless of this fact, I still struggled to maintain concentration. Still it was a step forward in the right direction, and that was realizing the impermanent and spontaneous nature of my thoughts. It was learning to control them. Two things I noted, Bhante has changed from the last Dhasa-sil; he removed lying meditation in the morning since most would have the tendency to fall into a deep slumber in that position, and the meditation periods itself were shorter and far more instructive. I usually write my journals based on highlights, epiphanies, and things worth remarking. So during our work period today, I had an event worth remarking on. Steven, Nisala, and I were given the task of cleaning out the downstairs bookshelf and organizing it with new Dhamma books. The books had various sorts of languages from Cambodian to Thai to Hindu. These books were in cardboard boxes lying outside. I noticed small peculiar holes in some of these boxes but I disregarded that and carried them with the help of Mr.Steven and Nisala. While I was cleaning the windows, I came downstairs to see the progress of the shelves. What I saw was revolting. Mr.Steven and Nisala unearthed a roach nest in one of the boxes under the books. The irony of the situation was as quoted by Steven “The roaches were trying to gain enlightenment”. It is certainly interesting that these roaches were born under the scriptures of the Dhamma. It reflects the fact how close many can be to Dhamma and not know it. After work period we had sutta discussion and then finally an Abidhamma session. Abidhamma in my opinion turned my world upside down. A lot that I used to believe was really not valid in Abidhamma. For an instance you gained more bad kamma for committing a heinous action without the awareness that it’s wrong rather than knowing it is. This session definitely triggered my interest in the Abidhamma. We followed with Atavisi Puja and then sleep. I woke up at around 5 a.m in the morning. I actually had a somewhat sort of decent sleep, thanks to the sleep deprivation I experienced last night. The sleep did not bother me since this was my last day. I felt a personal satisfaction within me because I did not waste this opportunity. The priests, my parents, and family friends have constantly told me how lucky I am. I understand why now. This is a very rare experience that lets me truly get closer to Dhamma and understand the significance of it. Plus the fact that I am doing it at a youthful age makes me extremely lucky. We went smoothly through the meditation session, morning and evening puja. We had no work day today but instead we visited the Cambodian temple. The Cambodian temple was very luxuriously designed. They were very reminiscent of East Asian Mahayana Buddhism but I wasn’t exactly sure whether they were Mahayana or not. This temple certainly changed since the last time I came here. After the temple visit we did an Abhidamma session with Uncle Deeptha. I want to thank Uncle Deeptha for this session since Abhidhamma really helps prove the validity of Buddhism. I really recommend all of you to learn it. Uncle Deeptha using the science of Abhidhamma delved into the phenomena of rupa and nama, the form and mind. He slightly explained how our mind was constantly changing. What was a huge shock to many of us I believe was that the mind dwells in the cavity of the heart. It was a heart attack for us. Finally we concluded with the last Atvasi Puja I will do for a while. Sadly. 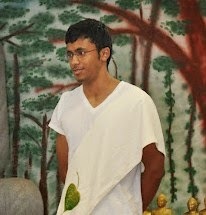 Nonetheless I accomplished a lot these past two years in Buddhism and look forward to furthering my knowledge. Thank you all for making this happen.